My Darling and Kimmy Jr. They are the of my . Darling, showering us with his unconditional and neverending love, care and joy. A blessing from God for a perfect partner who complements my life. A role model Daddy to his children. But I’m glad Jonathan boy got his Daddy’s look. Darling has beautiful eyes with double eye-lid and nice eyebrows. My eyes are smaller and no double eye-lid! I hope he has Darling’s set of teeth too…sitting straight, side by side each other. 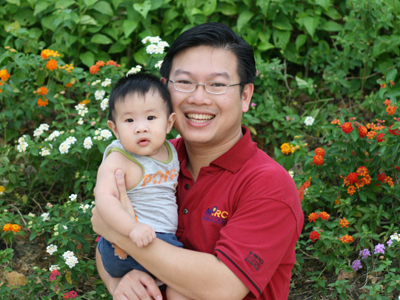 The above photo was taken when Jonathan is around 6 months old at Laguna Park in Klang by my sis’ with her SLR. The green background make the whole pic so outstanding and sharp, whatmore taken with a SLR. And here, the same photo appears in The Parenthood magazine of September ’08 issue. Yeap, it was selected as one of the consolation winner in the Stars of Pureen photo contest. This is the first time my entry is being selected in a photo contest. I have submitted a few photos previously but was unsuccessful. Not wasting the opportunity, I’ve also submitted my niece’s photo in the Fiffy’s Happy Holiday photo contest. Her photo was being selected in the September ’08 issue too! This 3+ years old cutie-chatter-box of my sis is a real beautiful and photogenic gal. Why I call her chatter box? She can talk and talk and talk. I love to challenge her speaking and thoughts by probing her with questions and giving her funny or unrealistic answers. This “evil” aunt just love to confuse her and I like the way she responded. Kid says the darndest things. But sometimes, she can really make your life up side down. Our 11 months of Jonathan boy is turning 1 year old soon. His two lower incisor has erupted. That will be his 7th and 8th tooth. He loves to play peek-a-boo with us. Whenever we say peek-a-boo, he will put his hand on his head or cover his eyes. From the peek-a-boo game, he now knows where is his head. Me: Jonathan boy, where is your head? This entry was posted on Monday, September 8th, 2008 at 6:16 pm and is filed under Family News, Jonathan. You can follow any responses to this entry through the RSS 2.0 feed. You can leave a response, or trackback from your own site. That great Jonathan can call you ma. i’m sure your heart melts…. Till today, Philip only can say Mum-Mum (refering to i’m hungry)…. No matter who looks like, he’s CUTE! all i can say is… aww… so sweet! MC – Jonathan only utter/babble those words when he feels like it. Sometimes it’s just coincidence his babbling sounds like words. Don’t be surprised when Keira starts to speak, she will not stop. Littlelamb – He don’t really call Mama yet. At times it sounded like he’s calling Mama or mum-mum. KittyCat – Can tell…cause his right eye is smaller and the shape look alike mine. The picture is very well captured. Both papa and little Jonathan looks so happy and contented 🙂 Congrats on the winning! congrats on wining! 🙂 he sure can babble very well.. you must be real proud of him and your hubby.. hehe..
Congrats to you of winning the contest. By the way, Jonathan and your hubby has fair complexion. Wah… it seems many blogger has won prize in the contest. Congrats!!! And hubby and I also always use the words ” at least we’re sure that we didn’t bring home the wrong baby” cos our little girl looks like a mini replica of her daddy! Jonathan knows how to talk already?? Sting – Thanks! He only babble when he feels like it. Debbie – You must be kidding that we look similar. She is darker, slimmer and taller than me. Lil Prince’s Mum – Thanks! Ryan’s Mami – He can’t talk yet. He only know how to say “mo more” depending on his mood. And hor.. I think u n ur hubby oso look-alike.. hahaha~~ husband-wife-baby.. all similar look..
Hi, good looking kid, and father too. Mom looks sensational….what I call a picture perfect family. Have a great week, and keep well, lee. AdEl – Welcome to my Cyberhome and thanks for dropping a comment. You’ve got a chubby baby Elyssa. Uncle Lee – Thanks for the compliment. Hope to see you around again. Congrats! Shd ask Kimmy to take off his glassess, then will look more alike. What are the gifts u get? Like what u said…I also complain to my hubby…after 9 months preggy, then the BB got daddy look..but when he smile at you and sayang u (lying his head on your chest!) you are then the most happiest person in the world!! Yugene – Welcome to my Cyberhome. Totally agree with you. Jonathan prefer to lie on my chest. Even when my husband and I sleep side by side, he will still snuggle to my side.